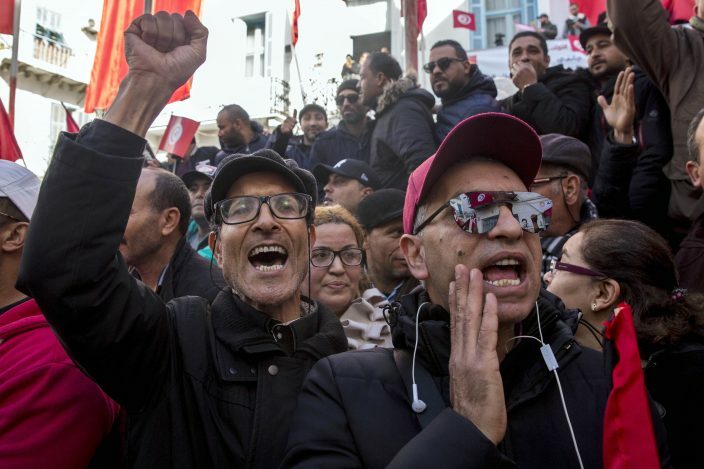 Workers around Tunisia went on strike Thursday to demand higher pay in a standoff with a government struggling to reduce unemployment, poverty and social tensions. All flights in and out of the North African country's main airport were cancelled, and schools nationwide were closed. Ports, public transport, hospitals and other public services were also disrupted. Marathon last-minute negotiations between the government and union umbrella group UGTT failed to avert Thursday's strike by public sector workers. Thousands of people gathered at the national union headquarters in Tunis and marched through the capital's main thoroughfare, carrying signs reading "Get Out!" and "The People Want the Fall of the Regime." Rallies were also held in other cities. Addressing the crowd in Tunis, the head of the UGTT, Noureddine Tabboubi, accused the government of "neglecting the workers" as runaway inflation has eroded purchasing power. The International Monetary Fund has urged public sector salary freezes and other reforms in exchanges for loans to Tunisia's struggling economy. The union boss accused the government of being afraid to "move a little finger without the green light" of the IMF. 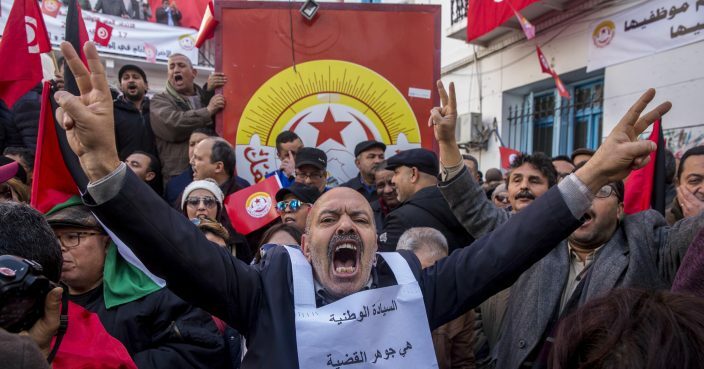 Unions want an end to salary freezes for Tunisia's 600,000 public sector workers. President Beji Caid Essebsi has called for calm. Thursday's strike comes after new tensions erupted last month when a journalist set himself on fire to protest unfulfilled promises of Tunisia's 2011 Arab Spring revolution. Similar rallies were held throughout the country, notably in southern provinces where the strike nearly paralyzed public services. Prime Minister Youssef Chahed warned that the strike would result in a "considerable cost" to an already fragile economy and might push the government to seek further foreign loans with tough conditions. Speaking on public television Wataniya 1 on Wednesday night, Chahed said, "We did everything possible to avoid the strike in presenting proposals that improve purchasing power while at the same time taking into account the country's capabilities." He invited the unions back to the negotiating table after Thursday's strike.